This invention relates to the use of alkyl amido quaternary ammonium salts, and formulations thereof, as thickening agents in aqueous based fluids, especially those used in oil field applications. In particular, the compositions of the present invention find use as gelants in fluids used in oil recovery operations such as fracturing fluids, completion fluids, and drilling fluids, that are used in the process of recovering hydrocarbons from subterranean formations. The quaternary ammonium salts of the present invention exhibit improved gelling characteristics. Hydraulic fracturing is used to stimulate the production of hydrocarbons such as oil or natural gas from subterranean formations. In this process, a fracturing fluid is injected through a wellbore and propelled against the formation strata by high pressure sufficient to cause the strata to crack and fracture. The fracturing fluid also carries what is referred to as a proppant to the fracture site. These proppant particles remain in the fracture thereby "propping" the fracture open when the well is in production. The proppant material is commonly sand, sintered bauxite, glass balls, polystyrene beads, and so forth. Traditional fracturing fluids were polymer based fluids. Naturally occurring polysaccharides such as guar and derivatized guar, upon dissolution in water, form hydrated polymers which can be crosslinked with organometallic compounds such as borates, zirconates or titanates to form a crosslinked gel structure which increases the viscosity of the fluid. However, these crosslinked polymers can ultimately form a rubbery semi-solid material that is difficult to recover from the fracture causing reduction in the conductivity of the fracture. Peroxides and other gel breakers are therefore often utilized to break the gelled polymeric structure into smaller molecules and facilitate clean-up of the fracture site. Production of oil or gas is often dependent on the ability to clean the fracture site of such materials. It is a widely known concept to use certain chemical agents to increase the viscosity or induce gel formation in aqueous or hydrocarbon based fluids. These gelled or thickened fluids may be referred to as viscoelastic fluids. The term viscoelastic is commonly understood to refer to a fluid that has the capability to partially return to its original non-disturbed form upon release of applied stress. It is believed that under the right conditions, i.e. concentration, counter ion, pH and so forth, that certain surfactants from rod-like or cylindrical micelles which can entangle to form these gelatinous, viscoelastic fluids in aqueous solutions. These thickened fluids are then capable of suspending the proppant particles and carrying them to the fracture site. These gelled fluids also diminish loss of fluid into the fracture face, thereby improving the efficiency in the fracturing process and reducing the overall cost. Viscoelastic fluids can be formed with a combination of ionic and/or non-ionic surfactants and by the incorporation of additives such as organic and/or inorganic salts. U.S. Patent No. 5,551,516 issued Sept. 3, 1996 to Norman et al. describe surfactant based viscoelastic aqueous fluid systems useful in fracturing subterranean formations penetrated by a wellbore, and state that the fracturing fluids are useful in high temperature, high permeability formations. Norman et al. state that the preferred thickening agents are quaternary ammonium halide salts derived from certain waxes, fats and oils. The thickening agent is used in conjunction with an inorganic water soluble salt, an organic stabilizing additive selected from the group of organic salts such as sodium salicylate. The fluids are said to be stable to a temperature of 225° F.
Similarly, US, 4,725,372 discloses thickened aqueous fluids comprising a water-soluble electrolyte and a thickener based on an amine, a salt of an amine, or a quaternary ammonium salt. Also the use of such thickened fluids in a variety of applications is suggested. A preferred thickening agent is said to be a tertiary amine of the formula C18H35N(CH2CH2OH)2 for aqueous solutions having a density of at least 15 ppg and comprising CaBr2 and ZnBr2. Various problems have been encountered with these gelled fluids in oil field applications including the lack of thermal stability of the fracturing fluids caused by the degradation of the additives or the instability of the gel upon exposure to high temperatures and/or high shear conditions. This can result in changes in the rheological properties of the gel which can ultimately affect the ability of the fluid to suspend proppant material. If proppant material is prematurely lost from the fracturing fluid it can have a detrimental effect on the fracturing treatment. Furthermore, gel instability can result in higher loss of fluid into the formation thereby diminishing the amount of fracturing that occurs. High temperatures in the formation can further impact gel stability. For high brine solutions, i.e. those having salt concentrations of about 30 wt-% or more, polymeric materials have been used as thickeners but tend to precipitate from these high salt concentration solutions which can result in plugging and formation damage. Furthermore, the high salt concentration makes it difficult to dissolve these polymeric viscosifiers or thickeners in the solutions. Such high brine solutions are found in completion fluids used in drilling operations. The present invention relates to improved gelling agents for use in oil field applications. In particular, the compositions find use in fracturing fluids, completion fluids and well drilling fluids. 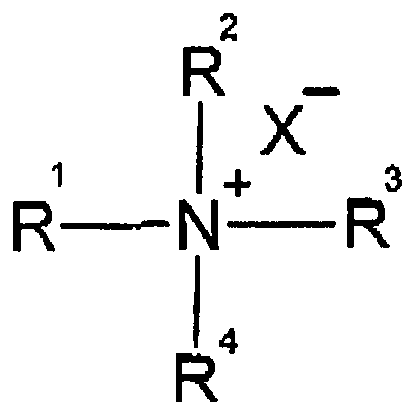 R1 is alkyl amine alkylene, alkyl amido alkylene, alkyl ester alkylene where the alkyl group contains 1-26 carbon atoms and the alkylene group preferably contains 1 to 8 carbon atoms; R2 and R3 are each alkyl, hydroxy alkyl, polyalkoxy with the degree of polymerization ranging from 2-30, alkyl sulfonate, hydroxyalkyl sulfonate or alkylaryl sulfonate; R4 is hydrocarbon such as alkyl, aryl, aralkyl, or alkaryl and can be saturated or unsaturated; and X is selected from the group consisting of halides; oxo ions of phosphorous, sulfur or chloride; and organic anionic molecules including the list of anions according to claim 1. The surfactants of the present invention, in combination with at least one additive which may be an inorganic salt, organic salt, organic acid, alcohol or a mixture thereof, form stable gels in aqueous environments. The present invention further relates to a method of fracturing a subterranean formation comprising the steps of providing a thickened fracturing fluid as described above, and injecting the aqueous fracturing fluid through a wellbore and against a subterranean formation at a pressure sufficient to initiate and or extend a fracture into the formation. The present invention further relates to a method of suspending particles in a thickened aqueous liquid by providing an aqueous medium and adding to the aqueous medium an effective amount of at least one surfactant and at least one counterion selected from the group consisting of organic salts, inorganic salts, organic acids, alcohols, and mixtures thereof, sufficient to increase the viscosity of said aqueous medium. The surfactant has the general structure as provided above. The thickened aqueous fluid is capable of suspending solid paniculate matter. The thickened fluid may then be further used to transport the solid particulate matter to a remote location. This type of method is useful in well-drilling operations, coil-tubing operations, construction operations, mining operations, and so forth, where it is desirable to remove solid matter from the site of operation. The present invention further relates to a method of reducing the friction of an aqueous liquid as it passes through a conduit by adding to the aqueous liquid, at least one surfactant of the present invention, and at least one additive which is an inorganic salt, organic salt, organic acid, an alcohol, or a mixture thereof. The amount of surfactant and additive added to the aqueous liquid are sufficient to reduce the friction of the aqueous liquid as it passes through the conduit. wherein R1 is alkyl amine alkylene or alkyl amido alkylene; R2 and R3 are each alkyl, hydroxy alkyl, polyalkoxy with the degree of polymerization ranging from 2 to 30, hydroxyl alkyl sulfonate, alkyl sulfonate or alkylarylsulfonate; R4 is hydrocarbon, saturated or unsaturated; and X is selected from the group consisting of halides; oxo ions of phosphorous sulfur or chloride; and organic anions. A further counterion, i.e. organic acid, alcohol, or mixture thereof, is optional in the case of the high brine completion fluid. These compositions have been found to provide a reversible thickening phenomenon whereby with increasing temperature, the viscosity increases. However, when the heat source is removed, and the temperature drops, the viscosity will again decrease. The monomeric surfactants of the present invention in the presence of organic or inorganic activators or gel promoters, can be used as thickening agents in aqueous based systems. where R1 is alkyl amine alkylene, alkyl amido alkylene or alkyl ester alkylene where the alkyl group contains 1-26 carbon atoms and the alkylene group preferably contains 1 to 8 carbon atoms; R2 and R3 are each alkyl, hydroxy alkyl, polyalkoxy with the degree of polymerization ranging from 2-30, alkyl sulfonate, hydroxyalkyl sulfonate or alkylaryl sulfonate; R1 is hydrocarbon such as alkyl, aryl, aralkyl, alkaryl and can be saturated or unsaturated; or wherein any two of R2, R3 and R4, together with the nitrogen atom to which they are attached, form a heterocyclic ring containing 2 to 5 carbon atoms and 1 to 6 sulfur atoms such as sulfur (S), nitrogen (N), oxygen (O) or silicon (Si); and X is selected from the group consisting of halides; oxo ions of phosphorous, sulfur or chloride; and various organic molecules. 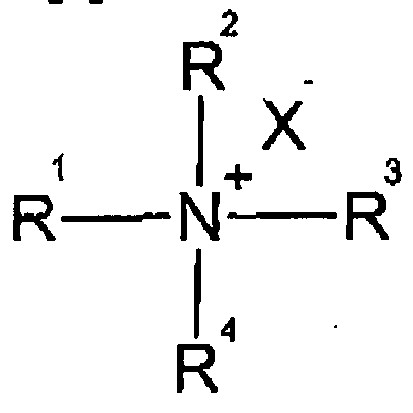 In some preferred embodiments of the present invention, R1 is alkyl amine alkylene or alkyl amido alkylene, and/or R2 and R3 are each alkyl or hydroxy alkyl. 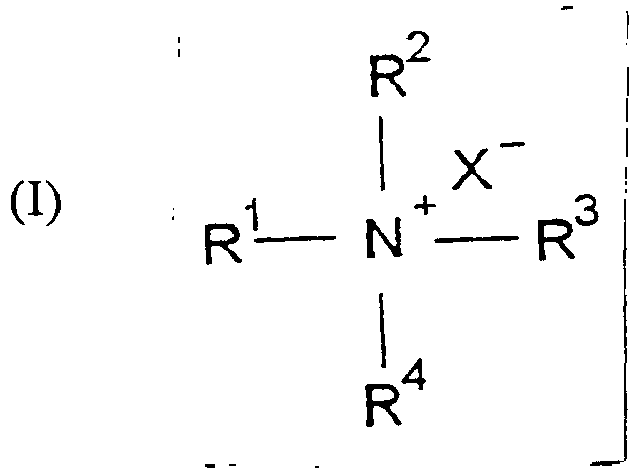 Examples of suitable alkyl groups, R2, R3 or R4 include methyl, ethyl, propyl, butyl, hexyl, allyl, benzyl, vinyl benzyl, and the like, including iso-propyl, isobutyl, sec-butyl, tert-butyl, and so forth. Examples of suitable hydroxy alkyl groups include 2-hydroxyethyl-2-hydroxypropyl and 2,3-dihydroxypropyl. Polyalkoxy groups are preferably ethyl, propyl or butyl. Alkyl sulfonate may also be referred to as sulfobetaines and hydroxyalkyl sulfonates may also be referred to as sultaines. An example of a sulfobetaine is propyl sulfonate and an example of a sultaine is 2-hydroxypropyl sulfonate. The thickening agent is employed in an amount which in combination with the other ingredients is sufficient to increase the viscosity of the aqueous fluid enough to maintain proppant in suspension during fluid placement. R2 and R3 are alkyl and preferably have from 1 to 8 carbon atoms; hydroxy alkyl preferably having from 1 to 8 carbon atoms; polyalkoxy including ethyl, propyl and butyl with the degree of polymerization ranging from 2 to 30; hydroxyalkyl sulfonate, i.e. sultaine; alkyl sulfonate, i.e. sulfobetaine; alkylarylsulfonate; R4 is hydrocarbon and can be alkyl, aryl, aralkyl, alkaryl, saturated or unsaturated; or wherein any of R2, R3 and R4, together with the nitrogen atom to which they are attached, form a heterocyclic ring containing 2-5 carbon atoms and 1-6 hetero atoms such as sulfur (S), nitrogen (N), oxygen (O), and silicon (Si); R is a saturated or unsaturated alkyl having from 1 to 30 carbon atoms, preferably from about 6 to 26 carbon atoms and most preferably from about 12 to 22 carbon atoms; y is an integer from 0 to 12, and preferably from 1 to 12; and X is defined above. 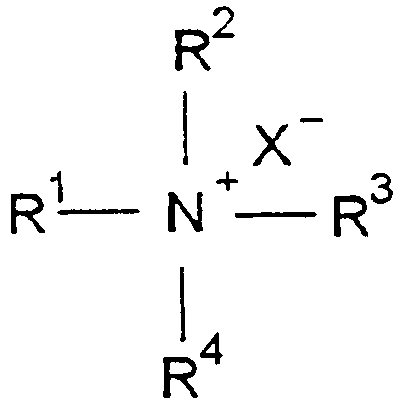 Suitable R groups include coco, palmityl, stearyl, oleyl, erucyl, as well as other saturated or unsaturated moieties. As a general rule, although other factors affect stability as well, the higher the number of carbon atoms in R, the better the stability of the resultant gel. 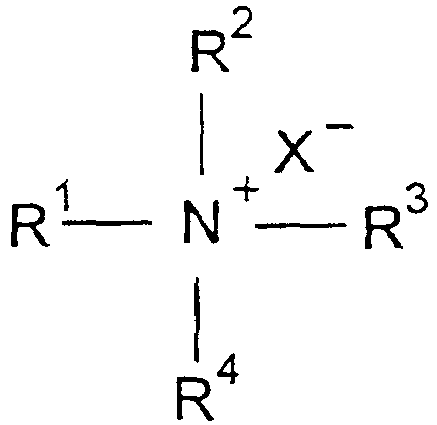 where R is erucyl (22 carbon unsaturated fatty acid chain); R2, R3, and R4 are methyl; and y is 1. X is preferably chloride. 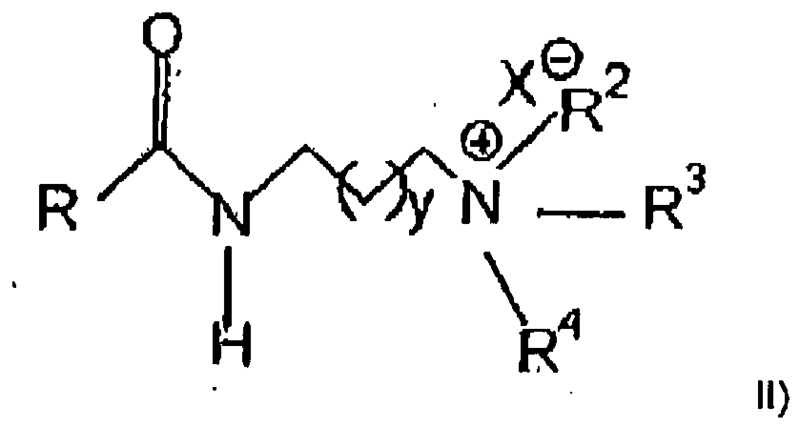 These types of compounds are obtained by quaternization of a corresponding alkylamidopropyltrimethylamide with methylene chloride, ethyl chloride, benzyl chloride, vinyl chloride, butyl chloride, methyl sulfate, chlorohydroxyalkylsulfonate, chloroalkylsulfonates and so forth, and mixtures thereof. The long chain alkyl groups, R, are hydrophobic in nature and are generally derived from a fatty acid. The fatty carboxylic acid is reacted with an amine to form the amide. These long chain alkyl groups are generally derived from the fatty acids and include cetyl, oleyl, stearyl, erucyl, and the derivatives of tallow, coco, soya and rapeseed oils. In a preferred embodiment of the present invention, the quaternary ammonium salt is erucyl amidopropyltrimethyl ammonium quaternary salt. R, R2, R3, R4 and X are as defined above. Preferably, R has about 6 to about 26 carbons and most preferably R has about 12 to 24 carbon atoms. As stated above, it has been found to be a general rule that R groups having a higher number of carbon atoms, result in a gel having better thermal stability. 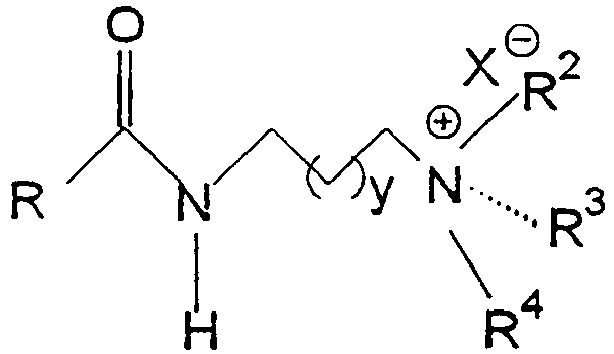 A specific example of structure VII, above, is dimethylalkylglycerolammonium chloride. Where R, R2, R3 and R4 are defined as above. X may be halides; oxo ions of phosphorous, sulfur or chloride; and various organic anions, including chlorides, bromides, iodides, oxides of phosphorous, hypochlorides, phosphates, phosphites, oxides of sulfur, sulfates, sulfites, sulfonates, phosphates, acetates, carboxylates, chlorates, perchlorates, salicylates, phthalates, lactates, maleates, glycinates, citrates, citric acid, lactic acid, salicylic acid, phthalic acid, benzoic acid, naphthoic acid, amino acids, and so forth. The concentration of the surfactant is preferably from 0.05% to 10% by weight of the fluid, more preferably from 0.05% to 6%, even more preferably from 0.1% to 5%, even more preferably from 0.2% to 4% and most preferably from 0.5% to 4%. The surfactants of the present invention are rheologically stable up to temperatures of about 300° F (about 149° C). In some specific embodiments, the surfactants are stable up to temperatures of about 110° C or 225° F, to about 275° F (about 135° C). It is important to note, however, that the gels can be used at low temperatures, i.e. 25° C, as well as in the operations where the temperature is high. The gelation is assisted by the presence of an activator or gel promoter. These are often referred to in the art as counterions or additives. An organic acid, a salt, either organic or inorganic, an alcohol, or any combination thereof, may be added as an activator or gel promoter so as to increase the viscosity of the fluid or in the development of the gel. Such additives can also aid in maintaining the stability of the geologic formation to which the fluid is exposed. The use of such compounds to improve the thickening characteristics of the fluid, are known to one of skill in the art. The compounds are chosen such that the thickening agent is compatible with the electrolyte to avoid the formation of undesirable precipitates. 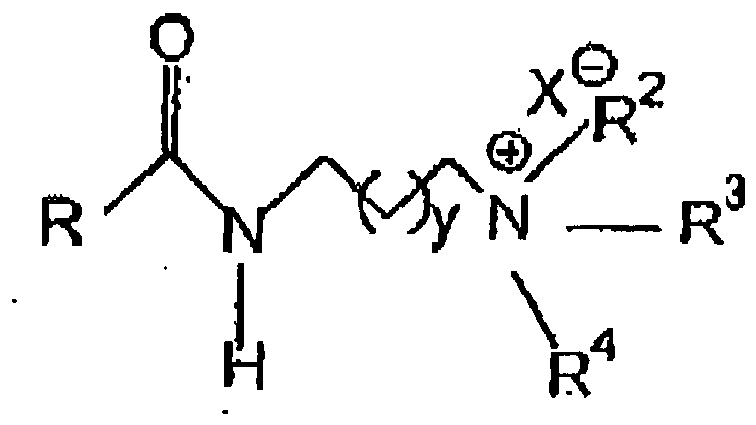 While some gelants, such as the sultaines or sulfobetaines, have been found to thicken or gel the aqueous fluids without the presence of the counterions, the gel stability has been found to be poor. The organic salts useful herein are typically water soluble compounds involving a metal or an amine salt of an organic anion. Organic anions include salicylates, phthalates, naphthalates, sulfates, sulfonates, lactates, glycinates, citrates, carboxylates, benzoates, chlorobenzoates, phenates, acetates, sulfobetaines, hydroxysultaines, and so forth. Preferably, sulfates and sulfonates are used in the present invention, and in particular, those having aromatic groups such as xylene or toluene are preferred. Specific examples include xylene sulfonate, p-toluene sulfonate, naphthalene sulfonate, hydroxynaphthalene sulfonate, ethoxylauryl sulfate, methyl sulfate, ethyl sulfate, and so forth. The organic acids useful herein include citric acids, lactic acids, salicylic acids, sulfonic acids, carboxylic acids, salicylic acids, benzoic acids, phthalic acids, naphthoic acids, and so forth. Specific examples include 3-hydroxy 2-naphthoic acid, 5-hydroxy-1-naphthoic acid, 7-hydroxy-2-naphthoic acid, 1,3-dihydroxy-2-naphthoic acid, 4-amino-5-hydroxy-1-naphthalene sulfonic acid, 2-amino-1-naphthalene sulfonic acid, and so forth. The organic acids or salts may be modified with alkyl, ether, alpha-olefin, alkoxylates including ethoxylates, aromatic groups, hydroxyl, amino, thio and so forth. A preferably class of organic counter ion is the sulfonate ion. These organic acids or salts are useful in the aqueous medium from 0.1% to 5% by weight of the composition and preferably from 0.2% to 1% by weight of the composition. The alcohols useful herein are preferably medium to long chain alcohols and may be alkanols or alcohol alkoxylates, i.e. alcohol ethoxylates. Alcohols are useful at a concentration in the aqueous medium of 0.1% to 4% by weight of the composition and preferably from 0.2% to 2% by weight of the composition. Inorganic salts or small quaternary ammonium salts such as tetramethyl ammonium chloride, are also useful to the present invention. Preferably, the salts will be salts of sodium, potassium, ammonium, calcium, magnesium, zinc and so forth. These ions preferably will be in combination with a halide ion. More specifically, the inorganic salt may include potassium chloride, ammonium chloride, sodium chloride, magnesium chloride, calcium chloride, calcium bromide, and so forth. These inorganic salts both aid in the development of the gel, and assist in maintaining stability of the geologic formation to which the fluid is exposed. These inorganic salts are useful at a concentration in the aqueous medium from 0% to 10% by weight, preferably from 1% to 6%. The concentration of the counterion or additive appears to be somewhat dependent on the size of the molecule, and that larger molecules may be added in lower concentrations. Specific examples of such counter ions include chloride, bromide, methyl sulfate, ethyl sulfate, xylene sulfonate, p-toiuene sulfonate, naphthalene sulfonate, hydroxynaphthalene sulfonates and carboxylates, 4-amino-5-hydroxy-1-naphthalene sulfonic acid, 2-amino-1-naphthalene sulfonic acid, 3-hydroxy-2-naphthenic acid, ethoxylated lauryl sulfate, sulfobetaines, 5-hydroxy-1-naphthoic acid, 6-hydroxy-1-naphthoic acid, 7-hydroxy-1-naphthoic acid, 3-hydroxy-2-naphthoic acid, 5-hydroxy-2-naphthoic acid, 7-hydroxy-2-naphthoic acid, 1,3-dihydroxy-2-naphthoic acid, 3,4-dichlorobenzoate, and so forth. Preferably, at least one organic counterion will be present in the compositions of the present invention. Although, in some preferred embodiments of the present invention both an inorganic salt and an organic salt, or acid, are utilized together with the quaternary ammonium cationic surfactant of the present invention. Preferably, the organic salt utilized is from the sulfonate family. The total amount of the additives present will preferably range anywhere from 0.1% to 10% by weight of the total composition. It is envisioned that the cationic surfactants of the present invention may also be used in combination with other surfactants such as anionic, non-ionic, amphoteric (or zwitterionic) surfactants. To prepare the aqueous fracturing fluid of the present invention, the viscoelastic surfactant is added to an aqueous solution in which has been dissolved at least one water soluble inorganic salt (i.e. NaCl, KCl, NH4Cl, NH4NO3, etc. ), and/or at least one organic salt, organic acid, or alcohol, to provide formation stability, or to provide selective control of the loss of particle suspension properties. As stated above, the salts both aid in the development of the gel, and assist in maintaining stability of the geological formation to which the fluid is exposed. Standard mixing procedures known to one of skill in the art may be employed in the present invention. Other ingredients may also be added to the fluids of the present invention including defoamers, fluid loss additives, breakers, demulsifiers, and so forth, as well as other polymeric materials such as guar, guar derivatives, starch, cellulose, polyacrylates, and so forth. Additives such as these are known to one of skill in the art. In some instances, it may be preferable to foam the fluids of the present invention by adding air, nitrogen, carbon dioxide, and a foaming agent. These gelled or thickened fluids may be referred to as viscoelastic fluids. The term viscoelastic is commonly understood to refer to a fluid that has the capability to partially return to its original non-disturbed form upon release of applied stress. It is believed that under the right conditions, i.e. concentration, counter ion, pH and so forth, that certain surfactants form rod-like or cylindrical micelles which can entangle to form these gelatinous, viscoelastic fluids in aqueous solutions. The gelled or thickened fluids of the present invention may exhibit a reversible thickening phenomenon. The fluids of the present invention may exhibit an increase in viscosity as the temperature is increased as opposed to most fluids which exhibit a decrease in viscosity as the temperature is increased. Furthermore, when the heat source is removed and the temperature decreases, the viscosity will also decrease. This phenomena, for instance, is illustrated in Table 11 of the Examples section where the viscosity of a high brine oil field completion fluid increases as the temperature is increased from about 170° F to about 250° F (about 76.7° C to about 121.1° C). The thickened fluids of the present invention find particular utility as fracturing fluids, in compositions used in well drilling operations, for proppant and cutting transportation to and from the fracture site, any drilling fluids. These compositions have also found excellent utility in completion fluids. Completion fluids are often used in high brine situations where the salt concentration (divalent salts such as CaCl2, CaBr2, ZnBr2, and so forth) may be as high as 30 wt% to 70 wt-%. Polymeric thickeners are not as advantageously used in such high brine fluids because the polymers tend to be incompatible in these high salt environments. The polymers often precipitate from the solutions which can result in damage to the subterranean formation. Fracturing of a subterranean formation involves pumping or injecting the aqueous fluid through a wellbore and against a subterranean formation at a flow rate and pressure sufficient to initiate and or extend a fracture into the formation. The thickened fluid also acts as a transportation vehicle for the proppant particles. These particles are carried to the fracture where they will remain in order to "prop" the fracture site open after the pressure is removed and the well goes into production. Keeping the fracture open allows for better flow of hydrocarbons from the site. The gels of the present invention have excellent thermal stability of greater than about 65° C, preferably greater than about 80° C, more preferably greater than about 90° C, even more preferably greater than about 95° C, and most preferably greater than about 105° C. Many of the preferred surfactants have been found to have thermal stability in excess of about 225° F (about 107° C), although in some instances the surfactants exhibit thermal stability in the 275° F (about 135° C) to 300° F (about 149° C) range. It is preferred that the compositions exhibit stability of at least about 185° F (about 85° C) to about 230° F (about 110° C). The gels of the present invention exhibit excellent viscosity stability to shear forces and high pressure and do not readily degrade upon exposure to high shear. This decreases the amount of fluid lost to the formation during the fracturing process when they are exposed to extreme pressures, and subsequently, leakoff rates for these fluids are low. The excellent thermal and shear stability of the thickened fluids of the present invention make them particularly useful for fracturing operations where the temperature is high and/or the fracture site has high permeability. If the viscosity of the fluid is susceptible to decrease at high temperatures, more fluid can be lost to the formation resulting in less efficiency in the fracturing process, and more fluid lost in the formation. The gel-like structure formed by the surfactants of the present invention may be disrupted on contact with hydrocarbon liquids, resulting in loss of viscosity. This can be advantageous for removal of the gel from the fracture once the fracturing process is complete and the well goes into production. The gels of the present invention also find utility in other various other oil field and non-oil field applications including gravel-pack applications, in acidizing treatments, as diverting agents or lost-circulation agents, in pipeline drag reduction, in coil-tubing operations, in drilling operations as drilling fluids, as completion fluids, as foamed underbalance drilling fluids, and so forth. The use of polymer-free viscoelastic gels in gravel-pack applications is discussed in Society of Petroleum Engineers (SPE) 17168, W.L. Nehmer, "Viscoelastic Gravel-Pack Carrier Fluids," incorporated by reference herein. The gels of the present invention provide excellent rheological properties making the especially useful in gravel-pack treatments where the rheology of the fluid is essential to achieving a good "pack". As opposed to polymer gels, the surfactant based gels of the present invention are not as susceptible to high shear forces. Further, they are less likely to damage the formation than those gels which utilize polymeric materials. The surfactants of the present invention find utility in gelled acid systems for use in acidizing carbonate and dolamite formations for prevention of loss of fluid in the formation due to the presence of natural fissures and cracks. The systems of the present invention provide a cleaner system than the polymeric based gels. The gels of the present invention find utility as diverting agents or lost-circulation agents which aid in preventing loss of treating fluid into the natural fissures and cracks in the formation. Again, as opposed to polymeric gels, the gels of the present invention impart less damage to the formation and are easier to clean out of the formation upon completion of the treatment. The gels of the present invention also find utility in reducing drag in pipelines. Pipeline drag reduction is discussed in U.S. Patent No. 4,615,825 to Teot et al. incorporated by reference herein. Surprisingly, the surfactants of the present invention provide more shear stability and greater reduction in frictional forces than polymeric additives. In a preferred embodiment of the present invention, a salicylate is utilized as the counterion in the composition, providing excellent drag reduction. The amount of surfactant and additive added to the aqueous fluid to reduce the friction as it passes through a conduit will depend on a variety of factors including the particular aqueous liquid, the surfactant chosen, as well as the type of additive chosen. In general, the concentration of the surfactant is preferably from about 0.01% to about 10% by weight of the fluid, and more preferably from about 0.05% to about 5%. The additive is preferably from about 0.1% to about 10% by weight of the total composition. The gels of the present invention find utility in both coil-tubing and drilling operations which involve the circulation of the thickened fluids through wells. The primary function of the gels in this instance is to transport cuttings or other fine debris including the filtered proppant out of the well bore. The gels of the present invention provide excellent rheological properties for such applications, and contribute minimally to the friction pressure. The thickened fluids are reusable upon removal of the cuttings from the fluid. These applications are discussed in U.S. Patent No. 4,735,731 to Rose et al. In drilling operations, in addition to the transportation of cuttings, the compositions of the present invention also find utility as drilling fluids to maintain the integrity of the wellbore and to lubricate the drill bit. Typically in these drilling operations, the fluids are referred to as drilling mud. The compositions of the present invention also find utility as completion fluids for drilling operations and for work over rigs. Viscosifiers are necessary in completion fluids in order to prevent too much water from filtering out into the porous surface of the formation, a phenomenon referred to in the industry as fluid loss. These viscosifiers are necessary both during the actual drilling process, and for preventing settling of the solids later on. The completion fluids are typically heavy brine solutions having a density in the range of about 11 pounds per gallon (~1099 kg/m3) to about 19 pounds per gallon (∼1896 kg/m3) as compared to water which is about 8.32 lbs/gallon. The gelants of the present invention are excellent thickeners for these high salt concentration fluids. The resultant completion fluids exhibit excellent thermal stability of at least about 250° F (about 120° C) to about 350° F (about 177° C). For these completion fluids, a small amount of surfactant in an amount of about 0.5 wt-% to about 4 wt-% facilitates gel formation. Furthermore, the use of counterions, e.g. inorganic salts, organic salts, organic acids, alcohols, and so forth, is not necessary. However, a small amount of counterion may be desirable. If a counterion is used, the desirable range is about 0.10% to about 5%. The addition of the counterions can improve gel stability but the gelants of the present invention function without the presence of such counterions. In a particular embodiment, sodium salicylate in an amount of less than about 0.2 wt-% was added in addition to the gelant. Non-oil field applications include applications in the mining and metal cutting industries. The compositions of the present invention may also be used in the construction industry during excavation, digging, tunneling, drilling, and so forth. They may also be used for dust control. The compositions of the present invention may also be used in the masonry, cement and concrete industries. The compositions of the present invention also find use as rheology modifiers, and may be used in household products including shampoos, detergents, cleaning products, and so forth. The viscoelastic surfactants of the present invention also exhibit drag reducing properties. KCl solution, 2% by weight, was stirred in a 500 ml stainless steel blender at an rpm of 200-300. To this solution, approximately 4 ml (∼60% by weight concentration in ethylene glycol) of the quaternary ammonium salt (dimethylamidopropyltrimethyl ammonium chloride) was added to the KCl solution(forming a 3% by weight concentration of surfactant). Witconate® SXS, xylene sulfonate, was added (2 ml, ∼40% concentration) and the resulting mixture was stirred for about 5 minutes at an rpm of 2000 to 3000 (Variact set at about 25). The resultant gel was defoamed using a sonicator and/or heating to 80°C. Rheological performance was evaluated using a model 50 rheometer (a Fann 50 Rheometer). The results may be found in the following tables. 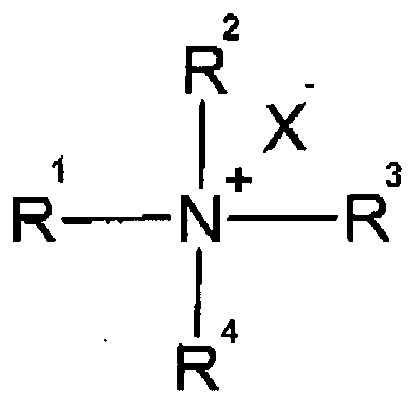 R is erucyl, (22 carbon, unsaturated fatty acid chain), R2, R3 and R4 are each methyl, y is 1, and X is chloride. This compound will be referred to hereinafter as erucyl-DMAPA quat. Preblending of the quaternary salt and the xylene sulfonate before addition to the water appeared to delay gel formation more than adding each ingredient to the water separately. Gel Composition: 2% KCL; 4% erucyl-DMAPA quat, 60% active (gelling agent); 2% Witconate® SXS (40% solution) sodium xylene sulfonate available from Witco Corp. Example 1 illustrates the rheological performance of a viscoelastic gel of the present invention. The gels exhibits high viscosity at low shear rates thereby providing excellent proppant transportation and control of fluid penetration into the formation when the fluid is forced at high pressure into the fracture face. The gel composition contained 2% KCL, 2% Witconate® SXS (40% solution), and erucyl-DMAPA quat gelant. Example 2 illustrates the effect of the concentration of the gelant on the rheological performance of the fluid. The amount of gelant may be tailored to the physical characteristics of the geological formation such as temperature and permeability. For instance, a fluid with a high concentration of surfactant thereby providing higher viscosity, would find utility in a high temperature formation. *Each of the compositions contained 2% KCL; 4% gelant; and 2% Witconate® SXS. Comparative example A was composed of 2% KCL; 4% Kemamine® EX-300 erucyl-amine gelant; and 5 lbs sodium salicylate/1000 gallons. The heat stability was approximately 200° F (∼93° C). Comparative example B was composed of 2% KCL; 4% erucylamidopropylamine oxide (45% active) gelant; 2% Witconate® SXS; and 1% Adogen® 471. Comparative B had heat stability of <175° F (79.4° C). Example 3 as compared to comparative examples A and B illustrates that surprisingly, comparable heat stabilities are being obtained with the gelants of the present invention as compared to commercially available gelants which are standards in the industry, even though the chemical structures are different. *The gel composition was 2% KCl, 4% erucyl-DMAPA quat gelling agent (60% active); and Witconate® SXS (40% solution) varied as shown in Table 4. *The gel composition was 2% KCl; 4% erucyl-DMAPA quat gelling agent (60% active); and the concentration of the sodium salicylate counter ion (25% solution) varied as shown in Table 5. *Each of the compositions in Table 6 contained 2% KCl and 4% erucyl-DMAPA quat gelling agent (60% active). The sodium xylene sulfonate counter ion and the ammonium alcohol ether sulfate counter ion produced the most stable gels, while those counter ions having naphthalene groups decreased the stability of the gel. The amount of counterion utilized to aid in gel formation appears to be somewhat dependent on the size of the counterion, and the larger the counterion, the less required. *Each composition contained 2% KCl; 4% erucyl-DMAPA quat gelant (60% active); and 2% Witconate® SXS sodium xylene sulfonate counterion. R2 was varied on the erucyl-DMAPA quat gelant. The smaller alkyl groups and the hydroxyalkyl groups appear to increase the stability of the gelled fluid. *The gel composition was 4% gelant (∼2% active). It can be noted that the gel formation time can be reduced for fluids less than 16 ppg when a counterion such as sodium salicylates are added. However, counterions are not necessary for the compositions of the present invention. For the gels which formed at room temperature, gel thickness could be increased with the addition of heat. In many instances, this is reversible. The rheological performance of the 19.2 lb/gallon density completion fluid brine was measured with a Brook field viscometer (#2 Disc at 0.3 rpm). The results are found in the following Table 13. The results found in Table 13 indicate that the amount of settling improves as the amount of the gelant of the present invention is increased from 1 wt-% to 4 wt-%. The aqueous based fluid of Claim 1 wherein said fluid comprises at least one additive selected from the group consisting of organic salts and organic acids. The aqueous based fluid of Claim 1 wherein said fluid comprises at least one additive selected from the group consisting of sulfates, sulfonates and salicylates. The aqueous based fluid of Claim 2 wherein said additive comprises at least one aromatic group. The aqueous based fluid of Claim 1 wherein said additive is an aromatic sulfonate. The aqueous based fluid of Claim 1 wherein said fluid comprises from 0.1% to 5% by weight of the additive. 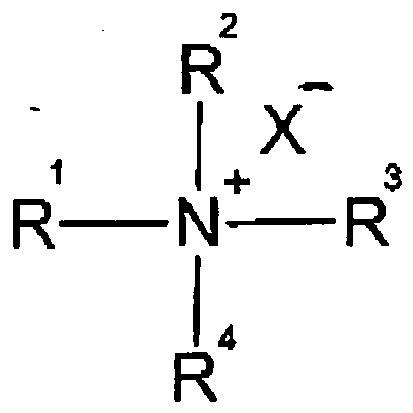 wherein R is saturated or unsaturated alkyl and y is an integer from 0 to 12. The aqueous based fluid of Claim 7 wherein R has from 6 to 26 carbon atoms. The aqueous based fluid of Claim 7 wherein R has from 12 to 22 carbon atoms. The aqueous based fluid of Claim 7 wherein the moiety R is erucyl. The aqueous based fluid of Claim 7 wherein y is 1. The aqueous based fluid of Claim 1, wherein said surfactant is present in said fluid at a concentration of 0.05 % to 10 % by weight of said fluid. The aqueous based fluid of Claim 1 wherein said fluid has thermal stability of greater than about 85 °C. The aqueous based fluid of Claim 1 in combination with a high brine liquid comprising from 30 wt-% to 70 wt-% salt. II) pumping the aqueous fracturing fluid through a wellbore and into a subterranean formation at a pressure sufficient to fracture the formation. The method of Claim 15 wherein said fracturing, fluid comprises at least one additive selected from the group consisting of organic acids and organic salts. The method of Claim 15 wherein said additive is selected from the group consisting of sulfates, sulfonates and salicylates. The method of Claim 16 wherein said additive comprises at least one aromatic group. The method of Claim 16 wherein said additive is an aromatic sulfonate. The method of Claim 15 wherein said gel has a thermal stability up to temperatures of about 110 °C. The method of Claim 15 wherein said fracturing fluid has thermal stability of greater than about 90 °C. The method of Claim 15 wherein said fracturing fluid comprises from 0.05% to 10% by weight of said cationic surfactant. wherein said aqueous liquid is sufficiently thickened to suspend solid particulate matter. The method of Claim 23 further comprising transporting the suspension of said solid particulate matter in said aqueous liquid to a remote location. The method of Claim 23 wherein said solid particulate matter is selected from the group consisting of cuttings and proppants. The method of Claim 23 wherein said method is implemented in a well drilling operation. The method of Claim 23 wherein said method is implemented in a coil-tubing operation. The method of Claim 23 wherein said method is implemented in a construction operation. The method of Claim 23 wherein said method is implemented in a mining operation. c) passing, said aqueous fluid through said conduit: wherein said viscoelastic surfactant and said additive are present in an amount capable of reducing the friction exhibited by said aqueous liquid as said aqueous liquid passes through said conduit. wherein R1 is alkyl alkyl amine alkylene, alkyl amido alkylene or alkyl ester alkylene where the alkyl group contains 1-26 carbon atoms; R2 and R3 are each alkyl, hydroxy alkyl, polyalkoxy with the degree of polymerization ranging from 2 to 30, hydroxyl alkyl sulfonate, alkyl sulfonate or alkylarylsulfonate; R4 is hydrocarbon, saturated or unsaturated; and X is selected from the group consisting of halides; oxo ions of phosphorous, sulfur or chloride; and organic anions, including chlorides, bromides, iodides, hypochlorides, phosphites, sulfates, sulfites, sulfonates, phosphates, acetates, carboxylates, chlorates, perchlorates, salicylates, phthalates, lactates, maleates, glycinates, citrates, citric acid, lactic acid, salicylic acid, phthalic acid, benzoic acid, naphthoic acid, and amino acids. The fluid of Claim 31 wherein the viscosity of said fluid increases when the temperature is increased and decreases when the temperature is decreased. The method of claim 15 wherein said cationic surfactant is erucyl amidopropyltrimethyl ammonium quaternary salt, and said additive is sodium xylene sulfonate. The method of claim 23 wherein said cationic surfactant is erucyl amidopropyltrimethyl ammonium quaternary salt, and said additive is sodium xylene sulfonate. The high brine completion fluid of claim 31 wherein said cationic surfactant is erucyl amidopropyltrimethyl ammonium quaternary salt, and said additive is sodium xylene sulfonate. Inventor name: BURGAZLI, CENT R.